MeshHire is a Cloud-based Social & Referral Recruiting internet software enables recruiters to create and manage their Branded Social Network for Hiring across social networking websites. Unlike other job board sites, you do NOT share your talent pool with others. All talents in your job site are private for your access only. 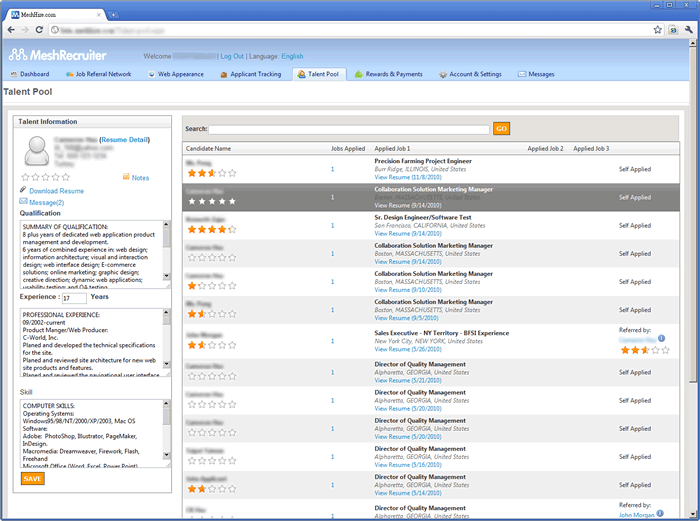 Recruiters can easily view, search, and download candidate resumes from your talent pool with ease. Recruiters can rate the candidates privately without the candidate's knowledge. This feature allows social recruiters to keep records of the candidates easily. Our interactive feature allows recruiters to communicate with the talents easily. Social Recruiters can send private messages to the candidates directly, OR send bulk new job notifications to everyone in your talent community.